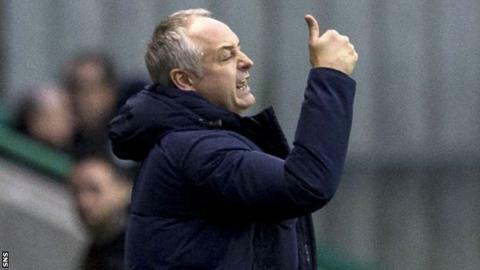 Raith Rovers' Ray McKinnon has been named Scottish Championship manager of the month for March. McKinnon, 45, led the Kirkcaldy club to five victories last month, including notable wins over promotion rivals Hibernian and Greenock Morton. Rovers, who drew 3-3 with league leaders Rangers on Saturday, are fourth in the Championship and have all but secured a place in the play-offs. Ex-Brechin City manager McKinnon took charge at Stark's Park last year.